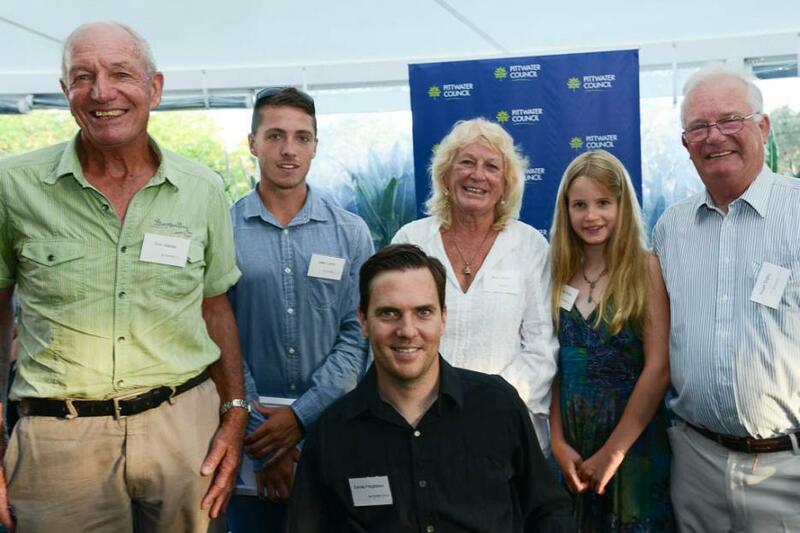 A community presentation of the 2013 Australia Day Awards for Pittwater began celebrations on Friday night at the Inch Café at Mona Vale. On Saturday morning, while enjoying a great breakfast provided by the Zonta ladies, SES Volunteers and the Rotary Club of Pittwater members a large crowd welcomed 40 new citizens from New Zealand, Brazil, Scotland, England, South Africa, France, Spain, Germany, the United States of America, the Netherlands and the United Kingdom. 2013 Pittwater Australia Day Awards: Left To right: Citizen of the Year Eric Martel, Sportsperson of the Year Jake Lynch, Beryl Driver, Senior Citizen of the Year 2013, Young Citizen of the Year Amelia Warde, Community Event of the Year, Rotary Carols in the Park, Roger Digby (Coordinator). Front: Sports person of the Year Daniel Fitzgibbon. Picture by Michael Mannington. Getting into the spirit of things, 7.30am, in Bert Payne resreve, Newport. Picture by A J Guesdon. Among these were whole families. We spoke with the father of one of these families, formerly from Brazil, the wonderful Orjz’s consisting of mum Andrea, Nicole, Rafael, Thiago and Mr Orjz. You have been here for 14 years, why have you decided to become citizens now? We decided we have been for so long we would like to make this country our new home. What is the best thing about living in Australia? The opportunities this country presents, the people are fantastic. Anything you want to achieve you can do here. I love what I do here and I do what I love so it’s great and the same for my family. Mr Orjz’s wife, Andrea, who has come here from Argentina explains that it has been her husband's dream since he was 13 years old to come to Australia. Since I was a boy scout, and 13 years old. It’s a fantastic country, beautiful Nature, the places you can go where I have never been before, the culture is great. The Orjz Family. Picture by Michael Mannington. ‘What makes Australia so great is it has a firm foundation; we have a good system of laws, institutions which uphold that system, which guarantee that we will be free….that we all have an opportunity to use our talents and achieve. We also have these beautiful surroundings, like out beach here, where we appreciate the beauty of our natural surroundings and our duty, as spoken by young Amelia today, of having to look after it …’don’t litter’…don’t spoil it, look after it. Because we are so lucky we have those obligations. The word ‘Australia’ offers opportunity to people but also asks for something back; and this is a community that does give back. Volunteering is a duty that is hugely important to the people of Pittwater and a willingness to help somebody if they’re in need or just to be kind and smile. I remember very well someone who came into my office seeking some help, they come from a different part of Sydney, and they had some real problems and when I asked her why she and her family had come here she said “Because you’re kinder here.”. what a nice thing to say about our part of the world. So if we can grow those traits and make them even more cohesive when we do look after people who have fallen on hard times or people who have disabilities who need to be assisted, then we will be a wonderful example to follow too. But each and everyone of us, no matter how insignificant we think we might be, has an opportunity to give in some way. I said at the beginning that Australia welcomes people from all over the world, and that’s our multicultural nature, and what has happened is that people have brought their talents and their skills and their ability and their culture here and it all goes into a bit pot and what comes out of it is uniquely Australian. But there are three things not welcome in the pot: Anyone who does not believe that men and women are equal; not welcome. Anyone who is prejudiced on the basis of religion; not welcome. Anyone who is prejudiced on the basis of race; not welcome. What we say here is that we welcome all and we acknowledge skills and talents and we acknowledge aspiration and we don’t want people to bring with them hatreds and prejudices. And when we look at that magnificent flag of ours as it was raised this morning, the most beautiful flag in the world in my view, designed by Australians for Australians, the important thing about our flag as one of our institutions is for us to recognise it. It’s our rallying point, it belongs to us, we’ve had many women who have laid down their lives and died for that flag, it’s a precious part of our heritage. As I look around and I see people wearing it on t-shirts or hats, some people get offended and say ‘Oh, we shouldn’t be doing that, it should be pristine, set aside’. I say no, part of the Australian character is to adapt its use to something that’s close to us and our heart. Just as we give everyone a nickname, a moniker, we shorten everything, it’s part of what we do and party of what makes us Australian. So when anybody asks you what is the identity of Australia you better go and ask them to do some research because the rest of us are perfectly sure on what we are and what we stand for; we are a kind and a generous people. We are a people for others across the world when they’re in need. We are a community here who looks after people here when they have need as well. On Australia Day I think it is wonderful for us to acknowledge the strength of our nation and that includes all. Tonight I’ll be going to a wonderful dinner where we have a lot of our children from Brewarrina, who are aboriginal children, coming down to enjoy the surf and the sea, and I will enjoy hearing some of the wonderful stories they tell me. On Australia Day we remember that we are all one people together and that we respect and love our neighbours, our friends and our people. So, as you go forth there are many things to be done today. Just be very proud to be Australian just as we are very proud of you who have made that decision to swear allegiance to this country. Happy Australia Day. Enjoying some pancakes from the Cottage Point SES team. Picture by A J Guesdon. Happy Australia Day. Firstly to everyone who is becoming an Australian citizen today; congratulations and thank you. Thank you for joining us, thank you for showing such respect to the society that has been created here that you have felt that you want to live your lives here and entwine the lives of your children with the lives of our children. Thank you so much for that great honour that you have given us all today. Ladies and gentlemen Australia Day is an opportunity for us to celebrate and to reflect. It’s an opportunity for us to celebrate our neighbours, our locality, the environment we share together and our good fortune to be in the best part of the luckiest country on earth. It’s also a day to reflect on those who have created the good fortune that we enjoy today. Any nation that is an amalgam of its places and its people, and here in Pittwater we have many iconic Australian places and also many iconic Australian people who over the past 225 years have given in service to create the society and its freedoms that we enjoy today. People like the aboriginal man Bungaree who in the early days of the Australian colony was the leader of the Pittwater clan and the Guringgai people and was so important a line of communication between the ancient culture he represented and the trans-Atlantic modern culture of the new colonists. Or people like Bayview woman Maybanke Anderson who not only was the founder of the Kindergarten Union, which today runs K2 kindergartens right across Australia, providing a wonderful pre-school education but who was herself one of the leading suffragettes who fought for women’s rights, and led to Australia being only the second place in which adult women were able to exercise the right to vote, a right we take for granted today. In more recent times, in every field of human endeavour from sport to literature to visual arts, everywhere you look Pittwater people have made a real contribution of service towards creating the wonderful society and the free society and the fair society that we enjoy today. The thing for all of us to reflect upon is how we can use our talents and our skills to contribute to building an even better and even freer society for the next generation. If we’re looking for inspiration we don’t need to look much further then fifty metres around us to see the work being done by the service clubs of Pittwater; the lions, Rotary, State Emergency Services, the Rural Fire Service or the Lifesavers protecting us on the beach for examples of quiet and modest and meek service to each other, that seeks nothing other then to serve our neighbours and that’s a powerful symbol of the servant nature that really marks out the Australian volunteer. So ladies and gentlemen, enjoy today, and once more, Happy Australia Day. Cottage Point RFS Volunteers at their pancake stand. Australia Day is a time for reflection on what we as a nation have achieved and what we can be proud of in our great country. In Pittwater we have achieved a great deal and we can be proud of our wonderful coastline, our unique bushland, our villages and of course our community. The contribution of these nominees to our local community and to our nation makes me very proud to be part of it. They have all excelled in some way, whether by their commitment to volunteering and fundraising, or through their chosen vocation or sport. But let us not forget to thank the people who nominated these great achievers. Thank you for taking the time and for having the initiative to recognise their achievements and identify them as leading citizens and role models for us here in Pittwater. Australia Day Award - Senior category. Lynette Millett has shown considerable commitment over the years as a wildlife rescuer. As a member of WIRES she has around 40 animals and birds in her care at any one time. She has also proved herself to be an effective mentor and trainer of new WIRES members. Ria Murch. Now in her 90s, she still demonstrates a great passion for the environment, a love of the arts and keeps abreast of politics. She is a great example of how one can remain active and engaged in the community in later life. Beryl Driver. Beryl has demonstrated an amazing commitment to fundraising for the children's charity Variety. For many years Beryl has taken part in the Variety NSW Bash which sees her and her friends drive close to 6000 kilometres from Sydney to Broome, Western Australia raising money for special needs children. Next year when Beryl becomes an octogenarian it will be her 15th Variety Bash! Beryl Driver (in blue top, yellow pants) and some of her friends. Picture by A J Guesdon. Australia Day Ambassador and 2013 Australia Day Ambassador for Glen Innes Shire. Marita Macrae, Founder and president of the Pittwater Natural Heritage Association whoworks tirelessly to improve Pittwater's natural environment, holding many events to educate the community on preserving our precious flora and fauna. Karin Nippard who has provided decades of care for the natural habitat of Pittwater. She has spent countless weekends working and training volunteers to assist with bush regeneration. In fact she has literally devoted herself to the preservation of Pittwater's natural environment to ensure it remains for all of us to enjoy. Pittwater young citizen of the year. 11 year old Amelia Warde from Elanora Heights. Amelia is just one of 10 youngsters from around Australia who is an anti-littering ambassador for Keep Australia Beautiful. Part of the 'Leading Integrated Taskforce Tackling Litter Everywhere' or LITTLE taskforce. Amelia has set herself the task of reducing litter by 10% in Pittwater over the next five years. Sounds like a great project! Lisa Stueckradt. A resident of Warriewood, Lisa has been member of the Manly Youth Council for over five years. She is currently Youth Council Secretary and is still heavily involved in organising concerts for young people in the area. Pittwater sportsperson of the year award category. Daniel Fitzgibbon from Mona Vale. Daniel has raced sailboats since his childhood. After a sailing accident left him a quadriplegic, he continued with his passion, winning the 2004 Disabled Sailing World Championship and winning the Australian Sailor of the Year with a Disability in the same year. Daniel's dream of winning a Paralympic medal came true in Beijing with a silver medal - yet for Daniel this was not quite enough! Paired with crewmate Liesl Tesch in London last year, and despite the tragic passing of Liesi's mother on day one of the games, they came out on top, receiving the first ever Australian gold medal in this event. Elanora Heights resident Mariafe Artacho del Solar. Mariafe excels in the sport of beach volleyball She recently placed third with her partner Taliqua Clancy at the SWATCH Junior World Beach Volleyball championships. Mariafe also recently received the 'Athletes Player of the Year Award' in the 2012 Renault Beach Volleyball Series. Mariafe was unlucky to miss out on the 2012 London Olympics, but is determined to be a competitor at Rio in 2016. Jake Lynch. Jake created history after winning two individual gold medals at the 2012 World Surf Lifesaving Interclub Championships in Adelaide. Since joining the Newport club as a nipper at five years old, Jake has arguably become the club's most successful athlete in its proud 103 year old history, as well as being an exceptional volunteer surf life saver. Max Brooks from the Newport Surf Life Saving Club. Also an exceptional athlete, he is currently the NSW Surf Life Saving Competitor of the Year and a finalist in Australia's Surf Life Saving Competitor of the Year. Community Event of the year. Mona Vale Public School Centenary Festival Day. This turned out to be an extremely successful event, attracting past and present students, families, teachers and staff, as well as many local residents. The event had fun activities for both children and adults as well as displays highlighting the history and future goals of the school. Rotary Carols in the Park. Held at Village Park, Mona Vale, this free community event always draws a large crowd. Last Christmas saw over 3000 locals enjoying the music provided by 80 children from the Sacred Heart Choir and Band, the Pittwater United Church Band and singer Samantha Shaw from Avalon. Mayor Jacqueline Townsend, local member Rob Stokes and Federal member Bronwyn Bishop joined the community in the singing of the carols and welcomed Santa bearing gifts for the children. Peter Aroney. Peter has recently retired after 34 years of commitment to public education. A Newport school teacher, Peter is well known for his calmness and perseverance, enabling him to connect with those children who have found school challenging. Peter is also a committed sports trainer. His Rugby Union teams at Newport have been state champions seven times – greater than any other school in NSW. He has coached champion teams in cricket and rugby league and coordinated athletics, swimming and cross country carnivals for the school, requiring a huge amount of dedication and commitment. Monika Biernacki. Monika has dedicated the last 18 years to her animal rescue shelter. She has saved, rehabilitated and re-homed over ten thousand dogs to date and takes significant effort to educate dog owners to be responsible. She is also a public advocate for animal ethics and is a popular point of reference for the media for animal welfare issues. Professor Michael Cousins AM. Michael is a world-leading specialist, who has accumulated 43 years of research, teaching and clinical innovation and development in pain medicine, in Australia and internationally. With the lifetime commitment to the wellbeing of people living with pain, their families and carers Michael has been a leading advocate for health policy reform to improve the management and treatment of pain. In 2010 he brought together more than 150 healthcare and consumer organisations for a National Pain Summit. Felina French. Felina has been involved in the Girl Guide movement since a young child, returning as a leader after her three children were born. Felina has given her time tirelessly to girl guides over many years and this is reflected in the flourishing number of enrolments in the local area. Felina runs state camps and jamborees which also involve overseas participants. She always demonstrates great enthusiasm and participates at all local Anzac Day, Australia Day and citizenship ceremonies. Through Felina's camps, the guides learn life-long skills and always talk excitedly about their wonderful experiences. Australia Day Award in the senior's category- Beryl Driver. Hayden Quinn, Eric Martel and Cr. Jacqui Townsend, Mayor of Pittwater. Picture by Michael Mannington. 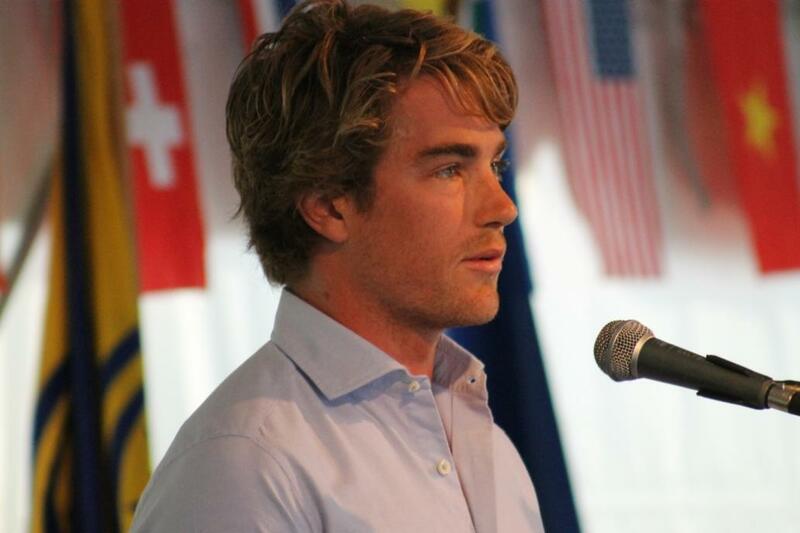 Pittwater's Australia Day Ambassador for 2013 - Hayden Quinn.